A bird is an instrument working according to mathematical law, which instrument it is within the capacity of man to reproduce with all its movements, but not with a corresponding degree of strength, though it is deficient only in the power of maintaining equilibrium. We may therefore say that such an instrument constructed by man is lacking in nothing except the life of the bird, and this life must needs be supplied from that of man. 'Of the Bird's Movement' from Codice Atlantico 161 r.a., in Leonardo da Vinci's Notebooks, trans. E. MacCurdy (1906), Vol. 1, 153. As given in Toby E. Huff, The Rise of Early Modern Science: Islam, China and the West (2003), 102, citing Tina Stiefel, Science, Reason, and Faith in the Twelfth Century (1976), 3. Helping others fly faster than sound. Helping those who must live on the ground? Oxfam poster, as quoted on various websites. (1902). Widely quoted, though always without a source, for example in Laura Ward and Robert Allen, Foolish Words: The Most Stupid Words Ever Spoken (2003), 68. If you know a primary print source to authenticate this quote, please contact Webmaster. How was your flight? Well, aeronautically it was a great success. Socially, it left quite a bit to be desired. I am happy to report to you that the assignment of the Central Committee of the Communist party of the Soviet Union and the Soviet Government has been carried out. The world's first space flight has been accomplished in the Soviet space ship Vostok. All systems and equipment worked impeccably, I feel very well and am prepared to carry out any assignment of the party and the government. Speech beside Khrushchev, at the tomb of Lenin and Stalin, Red Square, Moscow (14 Apr 1961). As quoted in Osgood Caruthers, 'Krushchev Leads Russian Tribute to Astronaut', New York Times (15 Apr 1961), 2. I have soared also above my pitch, attempting an Eagles flight with the wings of a Wrenne. In 'To the Reader', The Optick Glass of Humors (1607), 10-11. 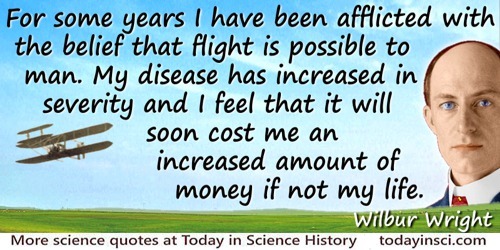 This is quoted by William Henry Hudson: “As the proverb says, ‘You cannot fly like an Eagle with the wings of a wren.’” in Afoot in England (1909, 1922), 80. 'Genetic Geography: The Development of the Geographic Sense and Concept', Annals of the Association of American Geographers, 1920, 10, 4. — Alan B. Shepard, Jr.
Man studied birds for centuries, trying to learn how to make a machine to fly like them. He never did do the trick; his final success came when he broke away entirely and tried new methods. — John W. Campbell, Jr. Published under the name Don A. Stuart, 'Who Goes There? ', Astounding Stories (Aug 1938). In Robert Silverberg, Ben Bova and Science Fiction Writers of America, The Science Fiction Hall of Fame (1973), Vol. 2, 62. 'The Scientific Spirit in Medicine: Inaugural Sessional Address to the Abernethian Society', St. Bartholomew's Hospital Journal, 1912, 20, 19. Quite likely the twentieth century is destined to see the natural forces which will enable us to fly from continent to continent with a speed far exceeding that of a bird. 'The Outlook for the Flying Machine'. The Independent: A Weekly Magazine (22 Oct 1903), 2510. Successful—four flights on Thursday morning—took off with motors from level ground—average speed thirty miles an hour—longest flight 59 seconds—inform press—home for Christmas—Orville. Telegram (17 Dec 1903) to his father, Bishop Wright, about the first flight in an airplane, at Kitty Hawk, N.C. As quoted in Heinz Gartmann, Rings Around the World: Man’s Progress From Steam Engine to Satellite (1959), 78. Surely no child, and few adults, have ever watched a bird in flight without envy. Isaac Asimov and Jason A. Shulman, Isaac Asimov’s Book of Science and Nature Quotations (1988), 3. The parts it cherish' d and repair'd before. Rebuild: so mutable the state of man. This necessary waste of flesh and blood. Or for the public, or some private use. The Art of Preserving Health (1744), book 2, I. 12-23, p.15-16. The chief art of learning, as Locke has observed, is to attempt but little at a time. The widest excursions of the mind are made by short flights frequently repeated; the most lofty fabrics of science are formed by the continued accumulation of single propositions. The Columbia is lost; there are no survivors. 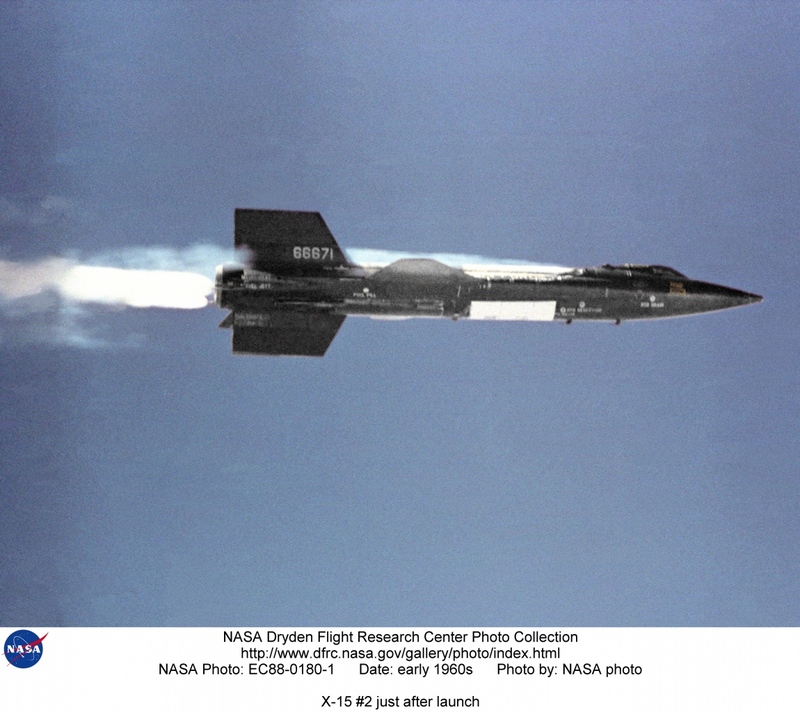 … In an age when space flight has come to seem almost routine, it is easy to overlook the dangers of travel by rocket, and the difficulties of navigating the fierce outer atmosphere of the Earth. These astronauts knew the dangers, and they faced them willingly, knowing they had a high and noble purpose in life. Because of their courage and daring idealism, we will miss them all the more. … The cause in which they died will continue. Mankind is led into the darkness beyond our world by the inspiration of discovery and the longing to understand. Our journey into space will go on. 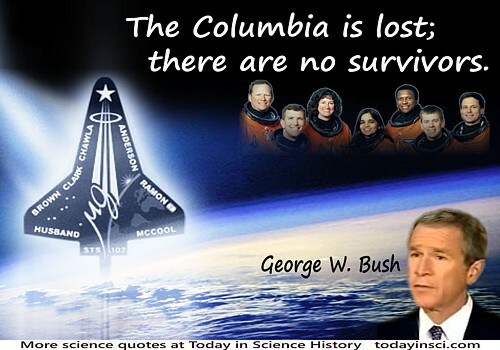 Address to the Nation on the Space Shuttle Columbia tragedy, from the Cabinet Room (1 Feb 2003). In William J. Federer, A Treasury of Presidential Quotations (2004), 437. The demonstration that no possible combination of known substances, known forms of machinery and known forms of force, can be united in a practical machine by which men shall fly along distances through the air, seems to the writer as complete as it is possible for the demonstration to be. Side-lights on Astronomy and Kindred Fields of Popular Science (1906), 345. The estimate we form of the intellectual capacity of our race, is founded on an examination of those productions which have resulted from the loftiest flights of individual genius, or from the accumulated labors of generations of men, by whose long-continued exertions a body of science has been raised up, surpassing in its extent the creative powers of any individual, and demanding for its development a length of time, to which no single life extends. In The Ninth Bridgewater Treatise: A Fragment (1838), 30. The Scientific Imagination: Case Studies (1978), 250. About the Apollo 12 launch, during which two electrical discharges almost ended the mission. 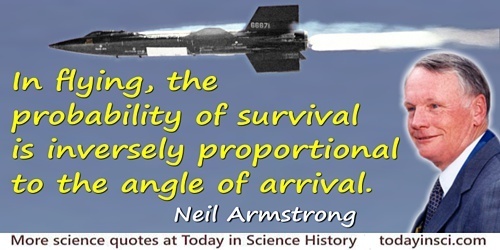 Quoted in Air & Space Smithsonian (2000), 15, 74. The generalizations of science sweep on in ever-widening circles, and more aspiring flights, through a limitless creation. In 'The Darwinian Hypothesis: Darwin on the Origin of Species', Man's Place in Nature and Other Essays (1910), 337. The so-called science of poll-taking is not a science at all but mere necromancy. People are unpredictable by nature, and although you can take a nation's pulse, you can't be sure that the nation hasn't just run up a flight of stairs, and although you can take a nation's blood pressure, you can’t be sure that if you came back in twenty minutes you’d get the same reading. This is a damn fine thing. . In 'Polling' (13 Nov 1948), collected in Writings from The New Yorker, 1925-1976 (1976, 2006), 60. The study of economics does not seem to require any specialised gifts of an unusually high order. Is it not, intellectually regarded, a very easy subject compared with the higher branches of philosophy and pure science? Yet good, or even competent, economists are the rarest of birds. An easy subject, at which very few excel! The paradox finds its explanation, perhaps, in that the master-economist must possess a rare combination of gifts. He must reach a high standard in several different directions and must combine talents not often found together. He must be mathematician, historian, statesman, philosopher—in some degree. He must understand symbols and speak in words. He must contemplate the particular in terms of the general, and touch abstract and concrete in the same flight of thought. He must study the present in the light of the past for the purposes of the future. No part of man's nature or his institutions must lie entirely outside his regard. He must be purposeful and disinterested in a simultaneous mood; as aloof and incorruptible as an artist, yet sometimes as near the earth as a politician. 'Alfred Marshall: 1842-1924' (1924). In Geoffrey Keynes (ed. ), Essays in Biography (1933), 170. To fly, we have to have resistance. It’s all about turbulence. Reacting to images of wave patterns in fluid motion. In Maya Ying Lin, Jeff Fleming, Michael Brenson and Terri Dowell-Dennis, Topologies (1998), 38. Trying to determine the structure of a protein by UV spectroscopy was like trying to determine the structure of a piano by listening to the sound it made while being dropped down a flight of stairs. We fondly imagine that evolution drives toward higher intelligence. But eagles would think evolution favored flight, elephants would naturally prefer the importance of great strength. Sharks would feel that swimming was the ultimate desirable trait, and eminent Victorians would be quite convinced that evolution preferred Victorians. Eater (2000). In Gary Westfahl, Science Fiction Quotations: From the Inner Mind to the Outer Limits (2006), 116. We will build a machine that will fly. As written in quotation marks by Pierre Lecomte du Noüy in Between Knowing and Believing (1967), 160, as a remark made to his brother, Jacques Montgolfier, in Spring 1783. The quote is also included in Isaac Asimov and Jason A. Shulman, Isaac Asimov’s Book of Science and Nature Quotations (1988), 4. Neither gives a citation. Because the quote is not more widely published, Webmaster doubts its authenticity, and has been unable to verify from an original source. Please contact Webmaster if you know a primary source. [In 1909,] Paris was the center of the aviation world. Aeronautics was neither an industry nor even a science; both were yet to come. It was an “art” and I might say a “passion”. Indeed, at that time it was a miracle. It meant the realization of legends and dreams that had existed for thousands of years and had been pronounced again and again as impossible by scientific authorities. Therefore, even the brief and unsteady flights of that period were deeply impressive. Many times I observed expressions of joy and tears in the eyes of witnesses who for the first time watched a flying machine carrying a man in the air. In address (16 Nov 1964) presented to the Wings Club, New York City, Recollections and Thoughts of a Pioneer (1964), 5.